Is NATO’s antimissile defense system in Europe a threat to Russia? A Romanian officer before the official ground breaking ceremony of an U.S. Aegis Ashore missile defense base in Deveselu, Oct. 28, 2013. Moscow has called the American antimissile defense system in Romania a threat to its security. Washington and Brussels insist that the system is not aimed at Russia and is helpless against Russian missiles. But is this true? 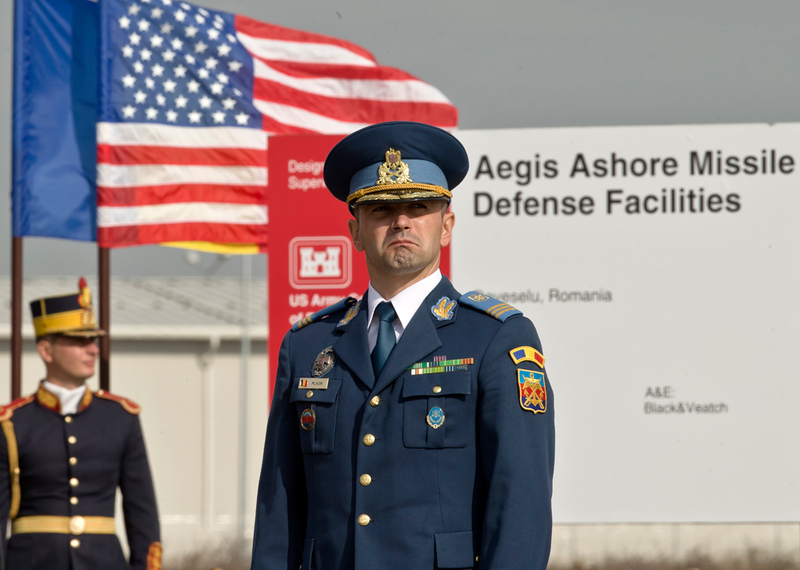 The first American antimissile defense system on European soil, Aegis, was inaugurated in Romania on May 12. On the following day NATO began building the second ground antimissile defense system in Eastern Europe, in Redzikowo, in northern Poland. While NATO assures Russia that the system poses no threat to it, Moscow has reacted nervously to the news. "There is no doubt that the deployment of the antimissile defense system is a real threat to Russia's security," said presidential press secretary Dmitry Peskov. For the last 15 years the U.S. and NATO have been trying to convince Moscow of the opposite, even though Washington left the treaty prohibiting the development and deployment of antimissile defense systems back in 2001. The U.S. insists that the antimissile defense system in Europe is part of a plan to create a global antimissile defense system and is not aimed at destroying Russia's nuclear missile potential. The West says that it is creating the system in relation to potential threats from countries such as Iran and North Korea. On May 12, NATO Secretary General Jens Stoltenberg stated that the antimissile defense system offers no physical threat to Russian missiles. "Geography and physics do not allow us to shoot down Russian intercontinental ballistic missiles [ICBM] since we have very few antimissile shields and they are located either too far south or too close to the Russian border," he said. According to Konstantin Bogdanov, a military expert at the news website Lenta.ru, Stoltenberg is “certainly right” as far as the Romanian base is concerned: “NATO neither wishes nor is able to use the base against Russia," he said. But the base in Deveselu, Romania is only one of the elements of the Aegis antimissile defense system. Its other components appear less innocuous, say the Russian military. Moscow believes that the antimissile defense system in Redzikowo, Poland, which should start functioning in 2018, bears a potential threat to Russian ICBMs. This opinion was mooted at the First Moscow Security Conference back in 2012. In the view of Russian specialists, after the appearance of the more advanced American missile interceptors, such as the SM-3 Block IIA and Block IIB, the U.S. will be able to attack Russian strategic missiles that could be launched from western and north-western Russia in the direction of North America. The new American missiles are expected to be completed in the 2020s. West and containment of Russia Why is NATO once again talking of deterring 'resurgent Russia'? But even more than the antimissile defense systems in Romania and Poland, the Russian military is nervous about Aegis' mobile components – the interceptor missiles installed on military ships. One expert stresses that in the event of a military conflict these ships can be concentrated near the coasts of Scandinavia, for example, in the Norwegian Sea. It is precisely this region over which part of the Russian ICBM trajectory to North America stretches. The appearance of the antimissile defense system in Deveselu has engendered Russian protests not only within the context of the overall antimissile defense architecture: Russia's military and diplomats also claim that the base in Romania violates the Intermediate-Range Nuclear Forces Treaty signed in 1987. The crux of the matter is that the antimissile launching platforms at the Romanian base can be used to launch cruise missiles, which is prohibited by the treaty. The U.S. assures Russia that it does not intend to use the launching platforms for these purposes. However, as Konstantin Sivkov from the Moscow-based Academy of Geopolitical Problems points out, the creation of infrastructure that even makes such launches possible is already "a gross violation of the INF Treaty." The bases in Deveselu, Romania and Redzikowo, Poland: Each has a SPY-1 radar and 24 SM-3 missiles.The radar at Kürecik, Turkey.At least four U.S. Navy ships equipped with the Aegis system.Command center at the U.S. airbase in Rammstein, Germany.